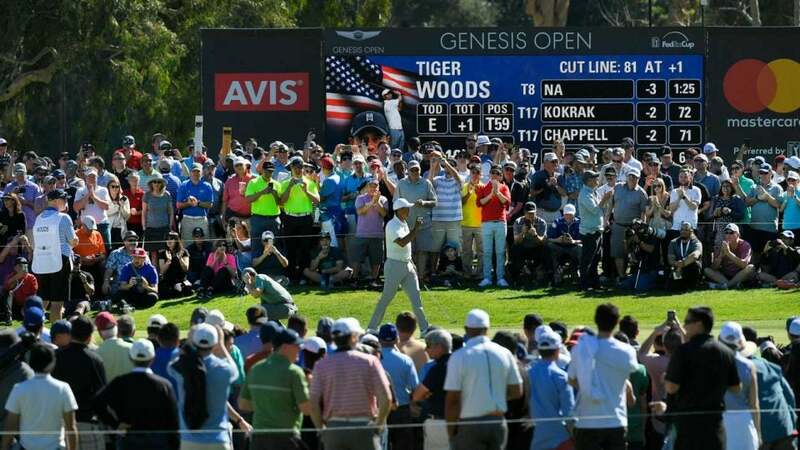 Massive crowds watch Tiger Woods at the 2018 Genesis Open at Riviera CC. The 2018-19 PGA Tour season is finally kicking into full gear, and in the second week of February the stars of the game (including Tiger Woods) will head to the 2019 Genesis Open in Los Angeles for what is sure to be one of the best fields of the new year. Here's everything you need to know before tournament week begins. The Genesis Open is held at historic Riviera Country Club in Pacific Palisades, Calif. The course, which was built in 1926 by George C. Thomas Jr. and William P. Bell, first hosted this event in 1973. It traditionally marks the end of the West Coast swing that acts as the opening stretch of events each year on Tour. The 2019 tournament will run Thursday, January 14, through Sunday, January 17. The TGR Foundation, which Woods started with his father Earl Woods in 1996, helps to run the Genesis Open annually. Tiger plays the role of tournament host and typically runs exhibitions and special events throughout the week to benefit the foundation. https://twitter.com/TGRLiveEvents/status/1091384702202568706 According the official website, the TGR Foundation "supports thousands of students in Southern California through various STEM education and college-access programs. Thanks to the generous support of the sponsors, fans and volunteers of Los Angeles, TGR Foundation continues to expand its reach to students and educators in LA through the Earl Woods Scholar Program and TGR EDU: Create professional development workshops." The field will not be official until the evening of Friday, February 8, but several PGA Tour stars have made an early commitment to play in the tournament. Sergio Garcia will certainly attract plenty of attention when he makes his first start since a controversial DQ in Saudi Arabia last week. But the entire field is loaded with top pros, including World No. 3 Dustin Johnson (who just won the Saudi International), Justin Thomas, Bryson DeChambeau, Rory McIlroy, Jordan Spieth, Bubba Watson, and many more. All of this sets up the potential for one of the best tournaments of the year.